The Last Pages is based on the rediscovery of a set of Letraset dry transfer letters by Noëlle Cuppens. When Cuppens found out that these transfer letters were no longer being made, she decided to use what she had remaining to ‘re-write’ the last book of Marguerite Duras: “C’est Tout” (No More). In her booklet Duras’ describes her fear of death and the approaching farewell to Yann Andrea Steiner, her love and muse. Cuppens had the remnants of 17 sheets and worked systematically through these sheets from tall to small and thick to thin, using templates to bridge the emptiness when running out of letters. As the pages progressed, they became more and more empty. The result is a manuscript of 96 pages on drawing paper with hand-rubbed letters. 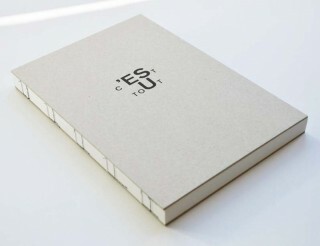 The Artist book includes a RISO printed version of the integral manuscript and is designed by Art Collart. With essays by Alex de Vries and Ellen Krutwagen and an introduction by Cuppens, translated into English and French. All books are signed with an original dry transfer letter K or W, the letters Duras didn’t use in her book.